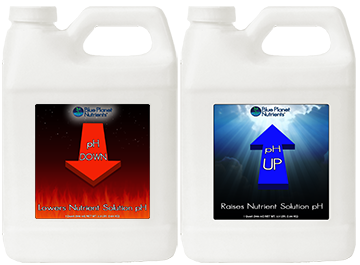 If you are feeding your plants with Blue Planet Nutrients they already have all the "essential" elements required for lush, rapid growth and a heavy harvest. Our supplements are designed to super charge plant growth and increase overall health of these types of plants. Sometimes plants face harsh environmental conditions. Whether it's unexpected heat, a cold spell, water stress, wind stress, or pathogens, Gold Shield will provide your plants with a superior level of protection. Gold Shield decreases plant's susceptibility to a variety of environmental stress. 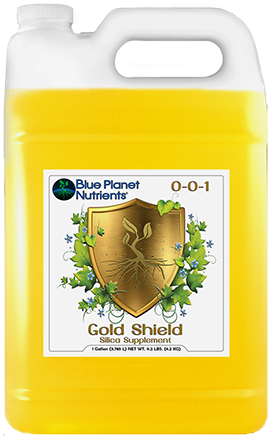 Gold shield also increases the strength of cell walls, stems and stalks allowing branches to hold more weight. In addition to the benefits of a sturdier plant, drought tolerance, micronutrient uptake, insect and disease resistance, and shoot and root density are also substantially increased. 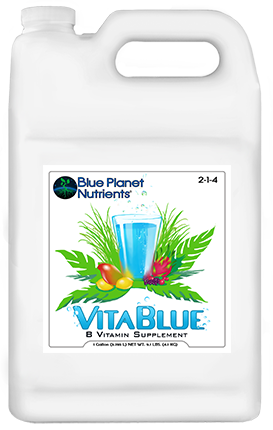 Vita Blue is a B-Vitamin supplement that improves the health of plants on several levels. B-vitamins are critical for maintaining a healthy metabolism, carbohydrate production, and many cellular processes within plants. Providing your plants with readily available B-Vitamins allows them to focus more of their energy on root development, vegetative growth, flower development, and the production of Essential Oils. Vita Blue also facilitates the efficient use of phosphate which is integral in fueling flower growth. 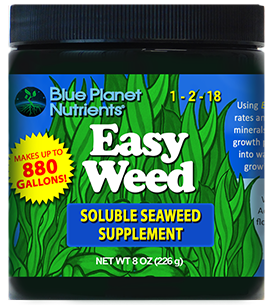 Blue Planet Nutrients Easy Weed Seaweed is our highly concentrated powder flake version of our popular Liquid Seaweed product. Just add a small scoop (1/8 to 1/4 teaspoon) to a gallon of water and that is all you need! It is packed with special naturally occurring growth hormones, trace elements, amino acids, enzymes, carbohydrates, and fully chelated readily available micro-nutrients. This all-natural supplement works well in any type of garden and is a great way to boost overall plant vitality. Easy Weed can help produce more successful clones, stimulate growth, and even help produce more fragrant flowers and sweeter fruits. Easy Weed is organic and dissolves easily. Suitable for any type of garden or growing medium. In the Ocean, seaweed is capable of remarkable feats of rapid growth in extremely unforgiving conditions. Seaweed contends with low levels of light and the constant pull of the tides and yet it is able to grow at stunning speeds. BPN Liquid Seaweed is packed with special naturally occurring growth hormones found only in seaweed, over 60 trace elements, antibiotics, and carbohydrates. 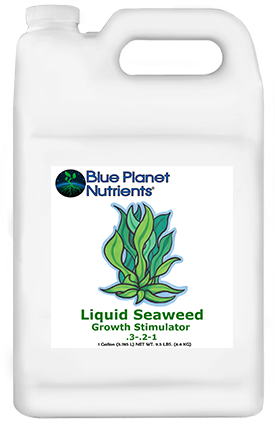 BPN Liquid Seaweed helps mother plants produce more successful clones, stimulates growth, and even helps produce better smelling flowers and sweeter fruits. Liquid Seaweed is 100% Organic. 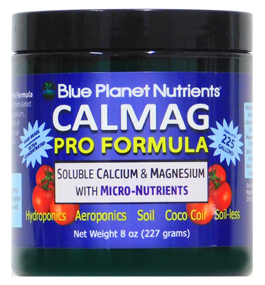 Cal-Mag Pro Formula is a soluble powder version of our popular liquid Cal-Mag with higher concentrations of Calcium and Magnesium! 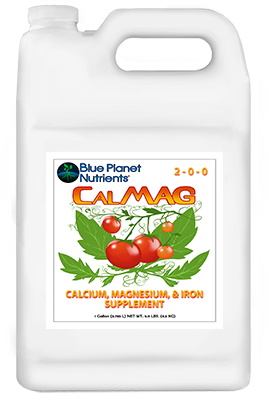 Cal-Mag Pro is an efficient delivery system for Calcium and Magnesium with the added benefits of chelated micronutrients! Only 1/2 gram to 1 gram per gallon/water of this super concentrated soluble supplement corrects most calcium, magnesium, and micronutrient deficiencies. BPN Cal Mag Pro is supplemented with additional chelated iron, chelated manganese, chelated copper, chelated zinc, boron, and molybdenum. BPN Cal-Mag is the professional's choice for preventing and correcting blossom end rot. BPN Cal-Mag Pro Formula is the best and most effective powdered cal-mag supplement on the market. 16 ounces makes 450 gallons! BPN Cal-Mag is an efficient delivery system for Calcium and Magnesium and Iron. This supplement is used for plants that require elevated levels of Calcium and Magnesium to reach their fullest potential. BPN Cal Mag is also supplemented with additional chelated iron. BPN Cal-Mag is excellent at preventing and correcting blossom end rot. BPN Cal-Mag strengthens cell walls resulting in stronger plant structures and greater overall health. Calcium and Magnesium play such important roles in plants that it is important to correct deficiencies in these nutrients immediately. BPN Cal-Mag is the best and most effective cal-mag supplement on the market. How do plants absorb water and nutrients? Through their roots of course! Is it possible to increase the surface area of roots by up to 1,000 times so they more efficiently absorb nutrients? The answer is Yes. Root Magic is a biological inoculum containing naturally occurring mycorrhizae. 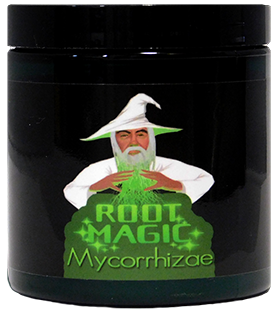 The mycorrhizae in Root Magic forms a symbiotic relationships with plant roots. The mycorrhizae gets a small amount of food from the plant and in return it increases the absorbing area of roots by up to 1,000 times. Root systems inoculated with Root Magic are more efficient at taking up water and nutrients. pH is very important in hydroponic as well as soil gardening. When the pH is not at the proper level, plants lose the ability to absorb some of the essential elements required for healthy growth. To maximize plant growth, the pH level of your nutrient solution should be slightly acidic. The ideal pH for most crops grown hydroponically is between 5.5 and 6.3. Users of Blue Planet Nutrients generally do not experience problems maintaining the proper pH range because our formulas are pH buffered. There are many factors that can affect pH levels, hardness of water, type of growing media, salt build up in system, root exudation, and extremely high growth rates. Always keep some BPN pH UP and Down on hand in the event that you need it.